Boy does it ever sicken me! What do people want? After reading Gina Kolata's article http://www.nytimes.com/2009/11/03/sports/03runner.html?_r=1&emc=eta1) (reporting on the web traffic saying that Meb Keflezighi is not an American & therefore not the 1st American in 27 years to win the New York marathon). I am so deeply saddened, that even amongst runners such racialism still exists. Hats off to Alberto Salazar coming out & saying that he too was born in another country & he was the last American to win NY! 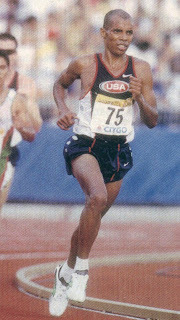 I wonder how many people know that Meb's physiology is that of an elite distance runner, but no more so than any number of other elite American runners. His secret is EXTREME dedication & commitment. His attention to detail, his self-discipline, his work ethic are legendary to those in the know. Meb, from my side, "Way to go my man - what a wonderful run, after the travails you have been through since your silver medal in Athens, this qualifies as one of the greatest comebacks of all time!" Hey Bobby! I miss you! Great comments on Meb. I watched it live and was so impressed. I was lucky to have met him when I was at the OTC and I have rarely met someone so proud to wear USA. I also found him to be so humble and down to earth. He is both an amazing person, athlete and American.